I'm back with my poor photos. 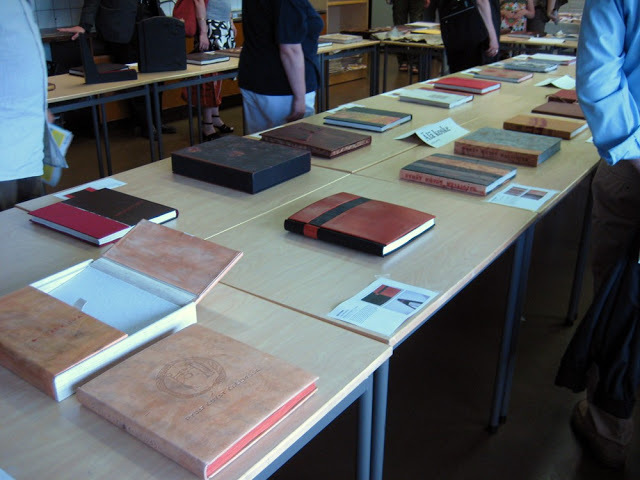 The book fair was so hot and crowded that I didn't take photos other than these from the bookbinding exhibition. The presentation could've been so much better, but you can get some sort of overview from my photos anyway. The book fair is held at a school and therefore the exhibition took place in a small classroom. This book won the first place. 4th and 5th place. My personal favorite was the book on the left. Really beautiful and well made. More photos from the medieval fair once I get back home from work! The secret book isn't a secret anymore! I won the second prize in Otava bookbinding competition! The award ceremony and exhibition won't be until summer, but I'll share my photos with you right away. These really aren't the greatest quality, as they were taken on a sunny day. More photos of the finished book, and more importantly the working process, can be found on Flickr, where my friends only set has become public. The book is generously illustrated Pyhät kuvat kalliossa, and it's about Finnish rock paintings, which more or less defined my color choices and the cover design. The book is quite large, about 26x28x3cm, and it has 176 pages. 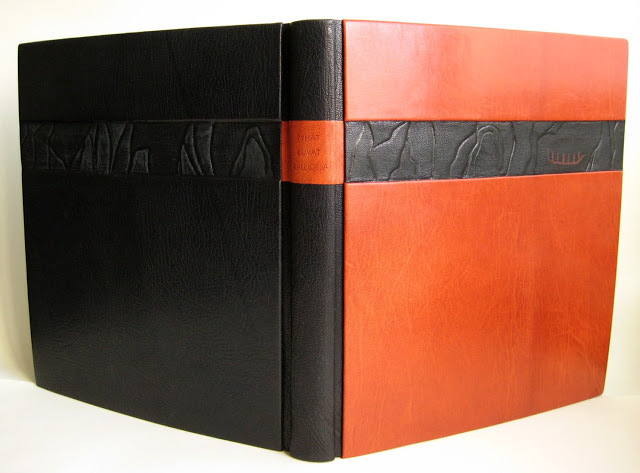 I bound it in full leather, using wonderful Harmatan goatskin in terracotta and black. There's a relief panel on both covers, which is slightly sanded too, to give a little more structure and variety. Hand sewn silk endbands. The book edges are hand cut, then bashed with a wire brush to give them texture and a little softness too. Wasn't this a bit different from what you've seen so far? Well, this is just something else I can do!